Brandon (Youngblood) is a tough street brawler whose brother Frankie is killed by gangsters. Now the gangsters are after Brandon for the 40,000 dollars his brother owed. Brandon then flees to a small Southern town where he develops a romance and also lives with his paraplegic father (Trejo). It's not long before Brandon enters the underground Punchfighting circuit where the reigning champion is Victor Dean (Balfour). It turns out the burgeoning romance is with Dean's sister Erin (Abromeit), and Victor's not happy. Brandon moves up the ranks and eventually faces off against Victor. Who will win? The biggest problem with this movie is the editing. There are weird, unnecessary cuts, as well as puzzling camera zooms and spins. The fights are pretty brutal when you can see them, as there are plenty of blood-soaked fences (yes, fences!) to show the extreme nature of the fighting. Also quite extreme is the now-prerequisite playing of the song "Wildfire in the Streets" by Tommy Fields. Surely the makers of all these modern-day Punchfighters must have known that fans don't watch just one of these things. If you like one, you probably will like them all, and fans would notice the constant reappearance of Tommy Fields. The plot is also haphazard, as there is a quick setup with the gangster Gino Ganz which kind of falls by the wayside until much later. All the cliches you know and love are present and accounted for - the training sequence and the silly love story, with its insipid dialogue. There's plenty of "Barnfighting", as Southern "redneck" stereotypes are beaten by Youngblood. There's, inexplicably, a TapouT octagon in the middle of a state fair in the deep south. Their tentacles reach from there to prisons everywhere, as Locked Down (2010) proves. Youngblood is relatively likable, but as you might expect, Danny Trejo is the best actor in the movie. He seems like he doesn't care, but it could be his character. If only the directing and editing were competent, this would be a not-bad modern-day Punchfighter. 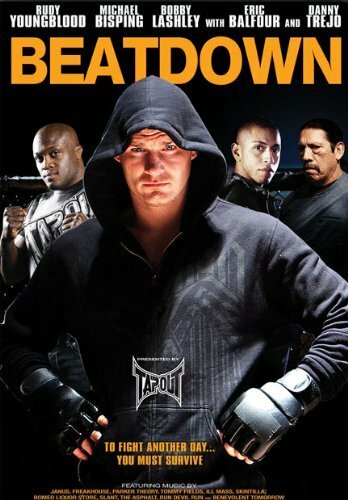 As it stands, Beatdown is not really a success. Nice write-up! btw, I live in GA and we have an octogon at every county fair! And in the prisons! And at the mall in the middle of the food court! Now let's make some movies!! Man, none of these MMA style movies are good. I don't understand it either. There is a real ability for good drama, but they can't do it. I think they are afraid of alienating the overly-macho fans of MMA. Dr. Algernon: Thanks! Let's make those movies! One of them could be: "Food Court: The Final Punch" with Heath Herring, Michael Madsen (as the coach in the mall), and Matthias Hues as a bully named Brutus. Hoaks2: That is a good point! These movies have the potential to be so much better. You need to pitch that to somebody - the tagline could be "Court is now in session." Haha, that is a good tagline! The editing was so awful and headache-inducing. If they got rid of that, it would have been a decent fight flick. I have a suspicion that you wouldn't have been as hard on the other aspects of this movie if the editing and music wasn't so cliche punchfighting-- but the thing is, how can we as a viewer ever take these movies seriously when they're presented in such a silly package? I don't know if you watched the featurette that came with the DVD, but the fight scenes looked a lot better as they were shooting them in real time. As much as I wanted to defend this one, I think the movie itself doesn't want to be defended with all those gimmicks. Totally agree! I did watch the behind the scenes, it was interesting to watch the fight scenes happen. There was no reason to put in ADD editing during post-production. I'm like the only one who doesn't have issues with MTV-style editing, shaky cam or lens flare but the one let-down for me was the person they chose to be the villain. I don't know who the actor is but he came off as rather bland. Maybe if they picked someone far more semi-well known like Al Sapienza (Sopranos, House of Cards) like they did with another MMA title, it would've been more fun. You're right. Totally forgot there was the gangster villain in this. Haha.